Wet wet differential pressure sensor with a high overpressure rating on both positive and negative side port for protection against accidental diaphragm damage. The DMD331 is an unconventional design for measuring differential pressure, in that two separate pressure sensors are utilised inside to measure the pressure at two ports. The difference between the two measurements are subtracted to create the differential pressure output signal. The main advantage of this type of sensor is that full line pressure can be applied to one side without damaging the sensor. This also makes it unnecessary to incorporate a complex mechanical protection device, keeping size to a minimum dimensions and reduces the cost compared to more conventional differential pressure sensor technology. The DMD 331 has 6 nominal pressure range from 0-0.2 bar up to 0-16 bar differential and each range has a choice of sub-ranges which can be selected depending on the required level of overpressure rating. The lowest possible scaled pressure range is 0 to 20 mbar differential and this can withstand a 500 mbar overpressure on either the positive or the negative port. The differential pressure signals can be transmitted as linear 4-20mA or 0-10Vdc analog output. The all stainless steel 316L DMD 331 wet wet differential pressure sensor is suitable for use with compatible liquids down to relatively low differential pressures. The compact size of the DMD-331 dp sensor makes it ideal for use in dense instrumentation packages where there is very little space between components for fitting a conventional dp transmitter. Monitor the differential pressure drop across a water filter to determine when it is necessary to perform the self cleaning process. I have a 10 bar line pressure and want to measure a pressure drop which ranges from 0-2 bar, which nominal range should I select for the DMD 331? To measure a 0 to 2 bar pressure drop, you can specify either 2.5 or 6 bar nominal range for the sensor. However the 2.5 bar range only has an over-pressure capability of 6 bar max, which is how you determine the maximum line pressure, and therefore this would not be suitable since it is below the required 10 bar line pressure. Therefore a 6 bar nominal range would provide ample line pressure capability up to 20 bar. The sensor output is then down-scaled in the factory to 2.5 bar for the 4-20mA differential output signal. On the last page of the data sheet there are options for nominal pressure range and differential pressure , what does this mean and what nominal pressure do I need if I need a differential of 6 bar? 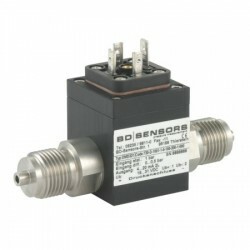 This sensor is different to a typical dp sensor in that it utilises two pressure sensing modules, one for each connection port, and subtracts the two pressure readings to determine the differential pressure reading. The main advantage to this style of dp sensor is it is possible to provide high one-sided over-pressure protection without relying on extra mechanical mechanisms, which increases cost, size and complexity. 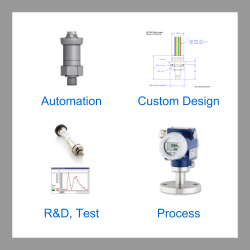 The nominal pressure range refers to the max pressure range of each pressure sensor. For each nominal pressure range it is possible to provide a choice of differential pressure ranges down 1/10 of the nominal pressure range. The main reason for this is to provide the optimal dp range for the line pressure of the pressure system. For example if your system pressure is 20 bar, the minimum nominal pressure range you could choose would be 6 bar which has a maximum permissible static pressure on one side of 20 bar. In this case you would have the optimal accuracy since there is no need to down-range the 6 bar, the sensor would be protected from line pressures up to 20 bar. What is the input voltage for the DMD331 with 4-20mA output and intrinsic safety? Any voltage between 14-28Vdc between the connections to the transmitter. We are looking for a intrinsically safe 4-20mA sensor to measure differential pressure across a Jet-A kerosene filter, the line pressure runs up to 100 psi and the maximum DP we need to measure is 40 psi? The BD Sensors DMD 331 is available in an ATEX approved IS version, and the 4-20mA output can be scaled to exactly 0 to 40 psi differential pressure, which can be used on line pressure up 290 psi. What is the limit on the differential pressure that can be applied to a DMD331 transducer, we have a max upstream pressure of 6 bar, and the differential pressure range is 0 to 100 kPa, so can it withstand the 6 bar? If you select a 2.5 bar (250 kPa) nominal pressure with differential pressure scaling of 0 to 1 bar (100 kPa) a 6 bar differential will not damage the sensor. It will be right on the specification limit, but this will provide the best accuracy and stability performance whilst achieving the required overpressure. The max pressure that can be applied to both ports, or one side only, without damaging the sensor is 6 bar g.
Please select the options you require for the DMD331 Compact Differential Liquid Pressure Sensor in your application and request a quote. Please enter info about your application and include any other requirements. Send us your enquiry for DMD331 Compact Differential Liquid Pressure Sensor to get assistance with this product type.